On 21 April 2013, the Secretary for Development published on his “My Blog” on the Development Bureau’s website inter alia that it is “our planning intention … to open the area of the military dock to the public when it is not in military use”, describing this as a “commitment … reiterated …in 2007” and that “the military dock is a marine-related facility co-ordinated and implemented by the Government”. 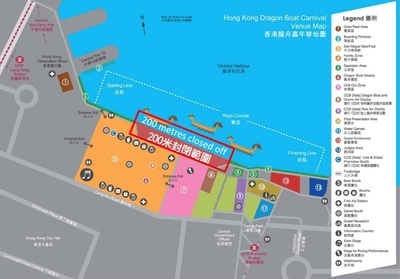 In 2013, the Planning Department reneged on these promises and asked the Town Planning Board to rezone a 150-metre long, 3000-square-metre strip of land in the middle of the Central Harbourfront Promenade solely for military use without any protection for the public’s rights of access. The amendments changed the nature of the site from “berthing of military vessels” required by the Defence Land Agreement to a “permanent military use”. There are no specific uses in Column 1 and Column 2 of the Notes to the Plan. Therefore, there will be no control over future development of any kind within the site. The new zoning allows (in theory) for the construction of closing fences or walls, and for a large structure on the harbourfront without the need for further planning applications to the Board. The site is in the middle of a public open space and this has serious implications for the enforcement of the law. This agreement was and is unknown. All zoning and urban design plans showed the area as Public Open Space until the publication of Outline Zoning Plan S/H24/8 in 2013. ‘When not in use’ is qualified by two matters: It would be the Garrison that would open the area to the public [not the Government, as promised to the HEC on 17 August 2009 and the HC on 2 March 2012]; and ‘Not in use’ would itself be decided “having regard to its operation and [the] need for protecting the military dock”. There are no terms in the Outline Zoning Plan stating explicitly that the site would be opened to the public when it is not in military use. There is no guarantee of public entry and usage in future. Designing Hong Kong stepped forward to represent the public’s interest and challenge the decision of the Town Planning Board. The High Court granted leave for the judicial review (HCAL No 49 of 2014) in July 2014. The High Court recognized that the case was to protect the public interest, and not for private or personal gain. Because Designing Hong Kong relies on public donations it could not afford to bring this case hence it found pro bono lawyers willing to help and applied for a ‘protective costs order’. However, the Courts decided not to grant protection because Designing Hong Kong was of the view that the Government does not have the right to seek costs against its supporters or to make them disclose private and personal finances. A late attempt by Ms Loy Ho to join was denied and legal aid for her appeal was refused. As a result the case has never been ruled on by the Courts. Now Government has ignored the public and all its own previous promises that this site would be open to the public and managed by Government. Instead Government has taken on the Town Planning Board’s unlawful decision and has made an unlawful decision of its own: Zoning the heart of Hong Kong’s waterfront for exclusive use by the military. The Outline Zoning Plan S/H24/8 together with a schedule of the representations and comments were submitted to the Chief Executive in Council (CE in C) and on 22 January 2019. The CE in C approved the draft plan and on 1 February 2019, notification of the approval of the draft plan was gazetted. We thank the legal teams who have selflessly provided pro bono representation since 2014. Members of the Central Harbourfront Concern Group: A Green Harbourfront Cyclepath for Pollution Free Hong Kong' campaign group, Animal Life Guard Action Group, Central and Western Concern Group, Clear the Air, Designing Hong Kong, Green Sense, Hong Kong Cycling Alliance, Land Justice League, Former Legislative Councillor Dr Kenneth Chan Ka Lok, The Professional Commons. 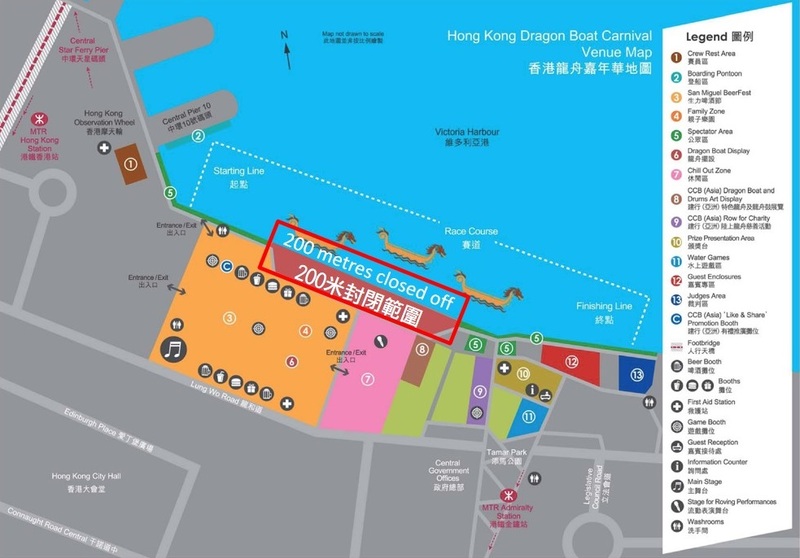 ﻿The 2016 Dragon Boat Carnival will take place at the Central Harbourfront between 10-12 June 2016. We are extremely disappointed that half of the 400-meter competition is blocked from view by the 200m closed public space - an area which was rezoned as a military berth in 2013. 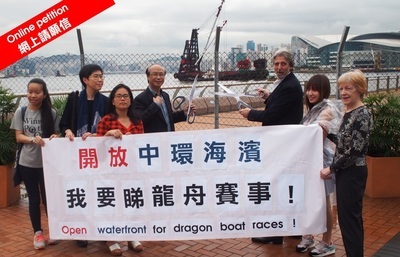 We urge the Lands Department to open up the fences and let the public enter the site to view the dragon boat races. The area can be managed by the organizer and/or LCSD as part of the promenade. You may have received emails from Town Planning Board confirming your allotted hearing session. We strongly encourage every one of you to speak at the hearing. You have been given 10 minutes to express your thoughts. 3) We will fill in the authorised person's name and HKID at a later stage. We are organising a workshop on November 3, 2-5pm at Poly University Room Y301. Besides briefing you on the background of the planning aspect of the pier, we will also explain to you about the proceedings of the TPB hearings. In addition, we will help you shoot your own video to be presented at the hearing if you're unable to attend. Feel free to bring your props, let's be creative! Please email info@savecentral.hk if you wish to attend. Thanks. The hearing process at The Town Planning Board to re-zone the Central harbourfront for military uses starting on 4 November. Here is an urgent appeal: Please make sure you will attend the hearing in person or by an authorized representative and reply to the Town Planning Board before 7 October. Together we shall fight against the plan with sound reasons and force the government to withdraw the amendment. The Central Harbourfront Concern Group will provide support for the preparation of the hearing and arrangement of authorized representatives starting next week. Please visit www.savecentral.hk for updates from time to time, or like our Facebook page. I shall attend the hearing on ________ (refer to the date stated on the TPB email) . If I wish to authorise a representative to attend, I shall notify the secretariat later. I request the Town Planning Board to offer additional hearing on Saturdays. If the Board decides to do so, please notify me.